There are two words that can make even the happiest person in the room depressed in an instant – hair loss. For women, hair symbolizes beauty and for men, physical strength and masculinity. Experiencing hair loss makes people feel sad, ashamed, and extremely self-conscious. When you start to lose your hair, your first question might be, why is this happening to me? The real cause of hair loss is not fully understood yet there are some reasons why you may be experiencing it. Your chances of keeping your hair depends on how sensitive you are to something called dihydrotestosterone or DHT. 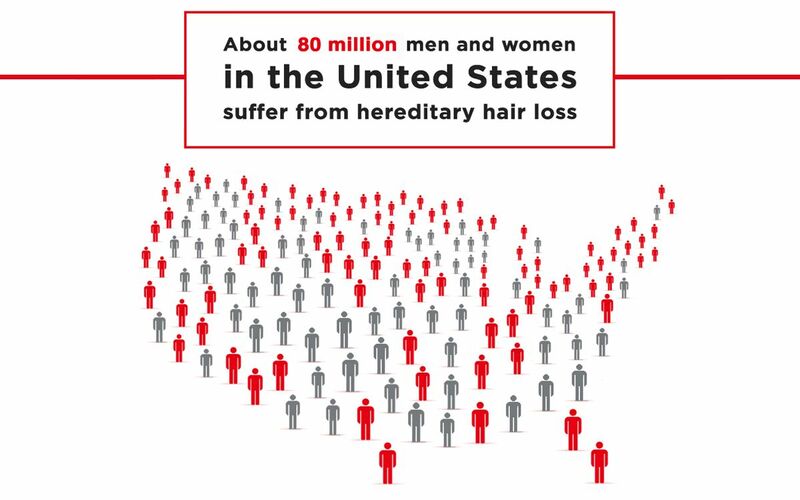 According to the American Hair Loss Association, by the age of 35, around two-thirds of American men will be dealing with some degree of hair loss. By age 50, it’s up to a staggering 85%! For a long time, there was the general belief that testosterone levels were the main culprit in causing hair loss. Scientists now believe that it’s not the amount of circulating testosterone that’s the problem but the level of DHT binding to receptors in scalp follicles. DHT is a hormone that stimulates the development of male characteristics. It is made through conversion of the more commonly known androgen, testosterone. But don’t think that DHT excludes women! The hormonal process of testosterone converting to DHT happens in both men and women and nearly 10% of the testosterone produced by an adult each day is converted to DHT. High levels of DHT may have an adverse effect on the health and functionality of hair follicles by causing them to shrink over time. Eventually, DHT may even cause the hair follicle to weaken and then eventually disappear. This sets off the hair miniaturization process by slowly rendering the hair follicle incapable of sustaining normal hair growth. Interestingly enough, although DHT is the main reason why men lose their hair, it is also known for putting hair on chest, back and other areas of the body. You just can’t seem to win with DHT, huh? So, what now? What can you do to stop DHT? That’s what we would have said 50 years ago. Thanks to modern science and research, we now know that one of the most effective ways is to make some additions to your diet. You can literally help your body reduce the effects of DHT and grow back fuller hair. An empowering thing is that we are somewhat in control when it comes to our hair and that’s by choosing to eat certain foods. Biotin, an important B vitamin, is actually the key nutrient for preventing hair loss and, according to scientists, it promotes growth of strong nails and hair. You’ve probably heard the word biotin and have seen it on a bunch of different hair products and there’s a good reason for that. A deficiency in biotin will lead to a dry scalp with the associated problems of dandruff, a flaky scalp, and dull, brittle hair. Adding in biotin-rich foods helps promote a healthy body, strong hair and glowing skin (and nails, for the ladies out there). The best part about buying biotin-rich foods is that they are all healthy, affordable and available pretty much everywhere. By eating these foods consistently you will most likely see improvement in your hair, and that’s great. Right? But ask yourself – is that realistic? Are you going to go to the grocery store weekly and buy every single one of these items and eat them for the rest of your life? Not only will it be costly, it’ll be a hassle to keep it up. …that is why we recommend a better, more convenient way which is getting these ingredients in pill form by taking supplements. A bottle of biotin, saw palmetto, and DHT blockers would each probably cost you…about $14.99 to $29.99 EACH. And that’s a lot of pills to be taking every day in addition to everything else you probably have on your kitchen counter. Surely there must be a better way, right? What if we told you there was a better way and that you can get everything you need in one simple bottle? Turns out there are formulas that include all the essential anti-hair loss ingredients to make regrowing hair easier – and it’s our very own iRestore 3-in-1 Hair Growth Formula. 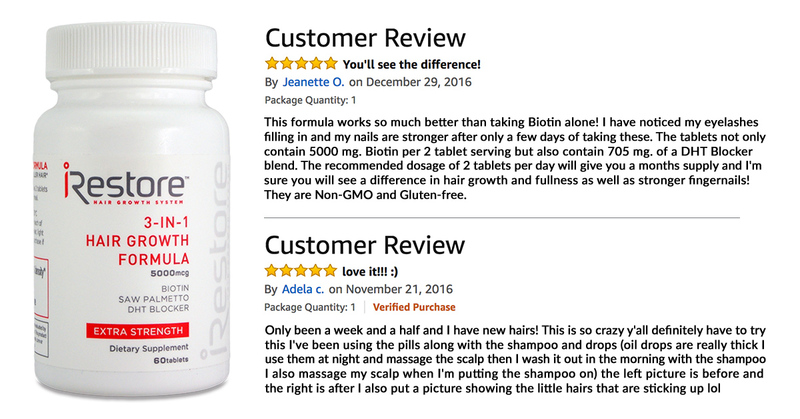 Instead of going on an expensive supplement shopping spree or buying biotin bottles, saw palmetto, and DHT blockers, the iRestore 3-in-1 Hair Growth Formula is made with all the essential ingredients you need. Think of iRestore’s 3-in-1 Hair Growth Formula as your single source–we’ve made it easy and consolidated everything you are looking for into one bottle. The iRestore 3-in-1 Hair Growth Formula combines ingredients that have been proven to promote the growth of thicker, fuller hair. Our supplements are manufactured in the USA using highly effective, premium quality ingredients that are 100% safe. With superior qualities like these, it would normally come with a high price tag. Here at iRestore, we have made our supplements to be inexpensive and a convenient supplement that takes the guesswork out for you. The DHT blocker blend contains saw palmetto which is a natural herbal remedy that has been used for hundreds of years to treat prostate cancer, bladder infections and, more recently, hair loss. 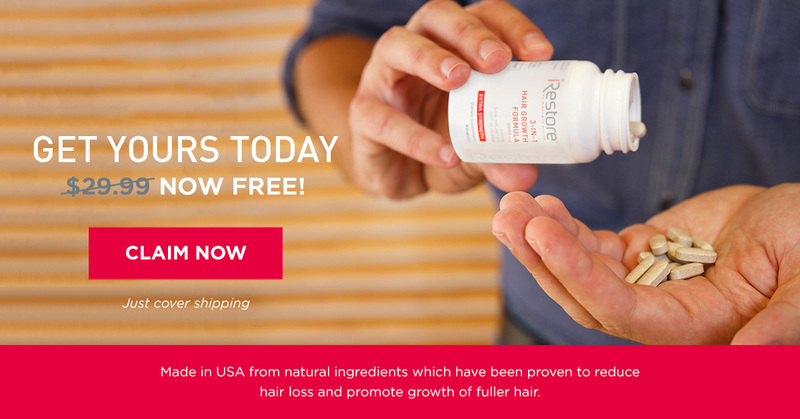 The iRestore 3-in-1 Supplement combines the most scientifically researched ingredients that have shown to fight the root cause of hair loss and thinning hair by inhibiting the 5-alpha-reductase enzyme, which is responsible for the hair miniaturization process. This process defends against hair loss and results in rapid growth of fuller, healthier hair. There’s no such thing as a magic pill, or is there? We think this is the closest thing to it! 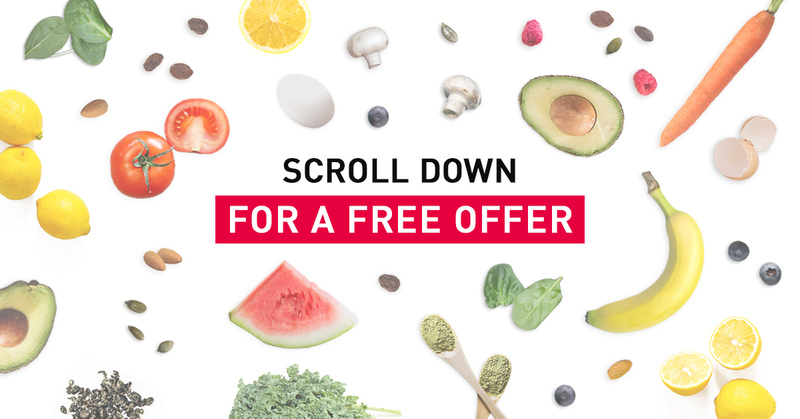 Don’t they say the best things in life are free? Here’s some more proof to back up that statement! We truly believe that this is one of the easiest and most effective things you can do for your thinning hair. In fact, we believe in it so much that we’re offering you the 3-in-1 Hair Growth Formula for FREE ($29.99 value). Yes, you read that right! We’re offering our supplement to you for free, all we ask is you cover the small cost of shipping. We want you to experience the amazing results that others users have reported from taking the supplement. Check out what others have had to say about our supplements below. The sooner you start making your hair a priority, the better results you will see. Hair loss is progressive and will likely get worse over time. That’s why it’s important to take action now to get the results and hair you’re looking for. Put your mind at ease, stop worrying and start growing back the hair that you desire today. 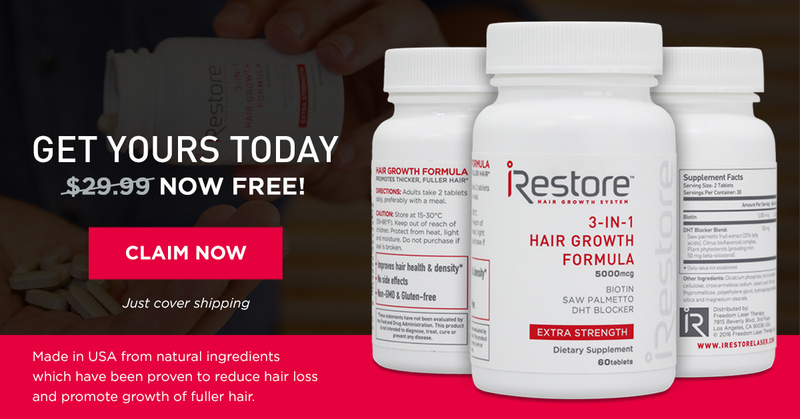 [Click here] to claim your FREE iRestore 3-in-1 Hair Growth Formula today before the limited time offer expires!